The GMCVB is excited to have officially launched the Essential Madison Experiences. The road to this project took our team more than a year to traverse, and we couldn&apos;t be more pleased with the newly developed experiences. As part of our commitment to the Destination Visioning objective of destination development (supporting existing attractions and creating new, original tourism concepts and experiences, ensuring authentic "only in Madison" experiences are supported and promoted), we at the GMCVB went to work to research, evaluate, gain perspective and enhance the ways that visitors access our amazing destination. Via focus groups, an experiential destination assessment, competitive destination research and much more, we learned much about our strengths, weaknesses, opportunities and threats when it comes to experiences in our destination. As you may recall last December, we invited Joe Veneto of Opportunities Unlimited to Madison Circus Space where he presented to you, our partners, how immersive experiences transform our tourism landscape and create new brand ambassadors for your business and the destination. As a result of the feedback and outcomes of the December gathering, the GMCVB contracted Joe Veneto to utilize his experiential development process. We then sent out a call for applicants in the experience development process and had a great response from partners interested in joining us in this product development. Aiming to work with partners representing experiential tourism gaps and to fulfill our goal to promote "only in Madison" authentic experiences, a committee was formed to help identify businesses supporting the goals of this project. Once selected, the group began product workshops, one-on-one business meetings, script reviews, previews and significant rounds of testing until the experiences were ready to be formally introduced. After seven and a half months of development, we completed the final testing of all of the experiences, and they are ready for bookings. Join us in celebrating each partner&apos;s hard work in developing an experience reflecting their unique brand stories and Madison&apos;s treasures. For more on these experiences, please check out our visitor guide and website. I&apos;d be remiss if I didn&apos;t acknowledge the tremendous team effort it took to get us where we are today. I know I speak for all involved that we feel privileged to represent and share the new experiences that honor Madison&apos;s character. We welcome you to join us in promoting and experiencing our destination. 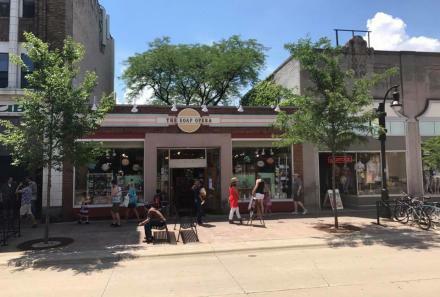 The Soap Opera has had an extensive history, even before moving into its current State Street location. Can you expand on the background of your iconic shop? The Soap Opera started when Chuck Bauer and Chuck Beckwith were fresh art majors out of UW Madison. They both had done some extensive traveling throughout their lives, and wanted to provide some of the many beautiful hard-to-find things they found in Europe, such as essential and perfume oils, custom scented products, hair brushes, and amazing customer service. They started rollerblading down State Street selling their goods out of a dresser and eventually moved into a house with a "retail" space below it on Lake Street in 1972. That was short lived until 1973 when the house burnt down. They then moved to State Street, and we&apos;ve been here ever since! We are still well-known for all the basic principles the store was founded on, such as customer service, variety, bringing natural products to the consumer and staying green. We also make sure to still provide hard-to-find bathing/grooming products for any age, income, or gender. As a part of your commitment to being green, how does The Soap Opera practice environmental sustainability? • We have switched to 100% Green renewable energy in our shop. What does that mean? It means we will save 17 TONS of carbon dioxide from filling our air per year, along with 16,241 pounds of coal from being burnt. It also means we are a leading partner with our local electrical company MG&E here in Madison to help switch people over to Green Power. • You can re-fill any of our house products to stop the use of "one-time use plastic,” AND get a discount for doing so! We have everything from body wash, shampoo, lotion, etc. that you can have re-filled over and over again, so you are not contributing to the problem of plastic in our world today. Plus, all of our house items are extremely natural and/or organic, and can come unscented or custom scented to your liking. • If you have your own container you’d like to fill with our house products, we are happy to do so, and give you a discount for doing this! The container MUST be 2oz, 4oz, 8oz, or 16oz however. For example, many people bring in glass jars in and we can fill them, as long as they are the correct size. • We sell many eco-friendly products. From candles that are completely clean-burning, recycled packaging, and soy ink for printing on the package, to shampoo bars wrapped in recycled paper, you can trust the products you’re getting from us have been researched with the environment in mind. Even the “big, name brand” products we carry have a positive environmental impact associated with their companies and will lean more on the natural side, rather than being packed full of harsh chemicals. • We used to keep thousands of receipts per year, for every transaction run in the store. We have since digitized all of these records. Receipt paper is not great for the environment, and we have gone from going through hundreds of rolls per year to 10 rolls maximum in a calendar year. For someone who is new to essential oils, what are some unique ways to use them in everyday life? That question has many answers. The best way to decide how to use essential oils in your everyday life is to come see us and explain what brought them into your train of thought. Do you want to cure an ailment? Do you want your house to be cleaned without harsh chemicals? Maybe you just want your space to smell nice! All of these would use different oil combinations and applications. What&apos;s nice is we&apos;ve been working with essential oils since the late 1960&apos;s, so we have the best knowledge in the business, and the best resources in obtaining our oils. We also teach an Introduction to Essential Oils class once a month. That is a one-hour class that goes over 15 of the most popular oils and their popular uses. We stop for the holiday season, but will start back up again in January. For me personally, I use essential oils for almost everything. I use them for skin care, hair care, headache relief, cold/flu relief, sore muscle relief, relaxation, good sleep remedies, and for my laundry & other household cleaning needs. It&apos;s not only an affordable partnership, but one that has given our shop many benefits. They get you in front of people right here in our community as well as people traveling into Madison. I like that you can post events and special offers on their website as well. What are some of your best local products that, if we haven’t tried, we should put on our next shopping list? Our house line of items sells the best in our shop. From our oils to our lotions, you can&apos;t go wrong! We have an organic bar soap with 12 different varieties that are amazing! Very affordable as well. We also sell a lot of our popular "cheese soap.” You have to come smell it. We really do have something for everyone, and if they&apos;ve never been into the shop they need to come see our selection! We have all your needs met, from shaving/grooming, children/baby, to making your own custom perfume or essential oil blend, and everything in between, we&apos;ve got you covered. We offer 24 brews on tap representing a constantly rotating selection. Also featuring a full menu with a traditional Friday Fish Fry and Breakfast every Saturday & Sunday.